Let's face it, we women have to spend some time to pamper ourselves and undergo a make-over if only to make ourselves feel great and relaxed. 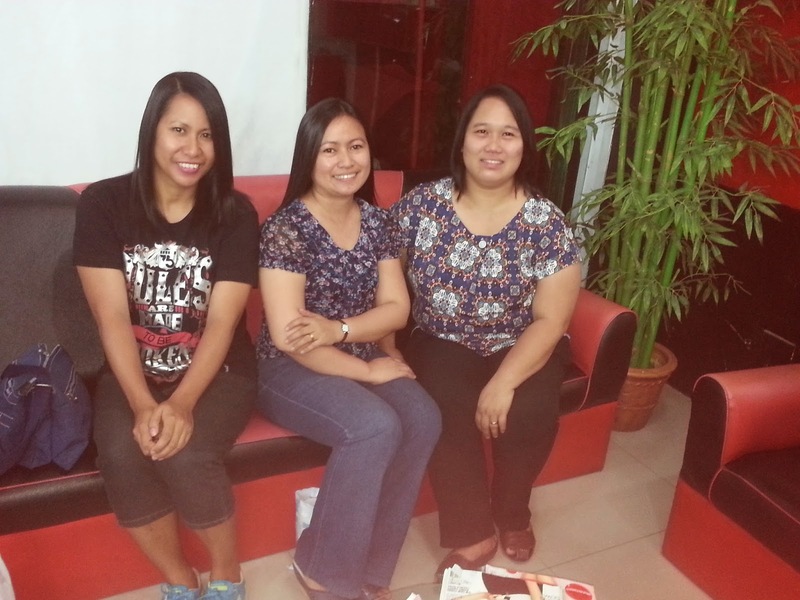 After months of planning, me and my friends finally had the time to visit a salon and have our hairs groomed. The whole Hair Rebond Process takes around six (6) hours so scheduling our parlor adventure with our hectic schedule at work was quite a challenge. Eat just enough before going so you don't get hungry in the process. Believe me six hours of just sitting down looking at your face could be a bore for those of you who hate beautification thingy like me LOL. 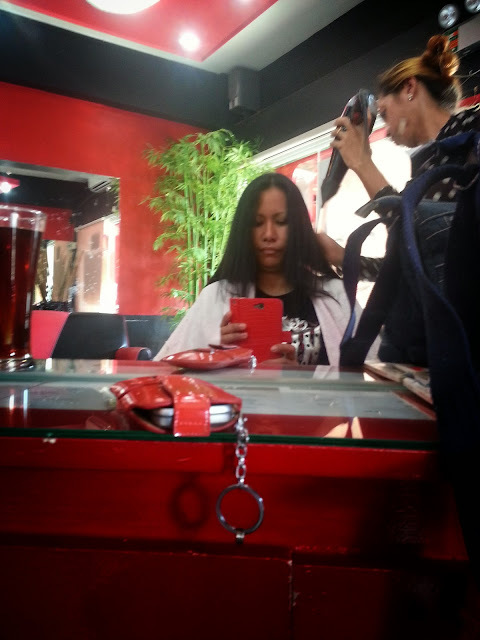 It wasn't my first time to have my hair fixed to a totally straight appearance. The first time was around three years ago. 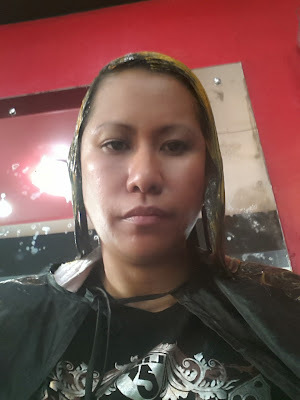 It was not an impulsive decision because when it comes to chemicals being applied on my body and sitting for prolonged period of time in front of a mirror you'd have to convince me a gazillion of times before I oblige. 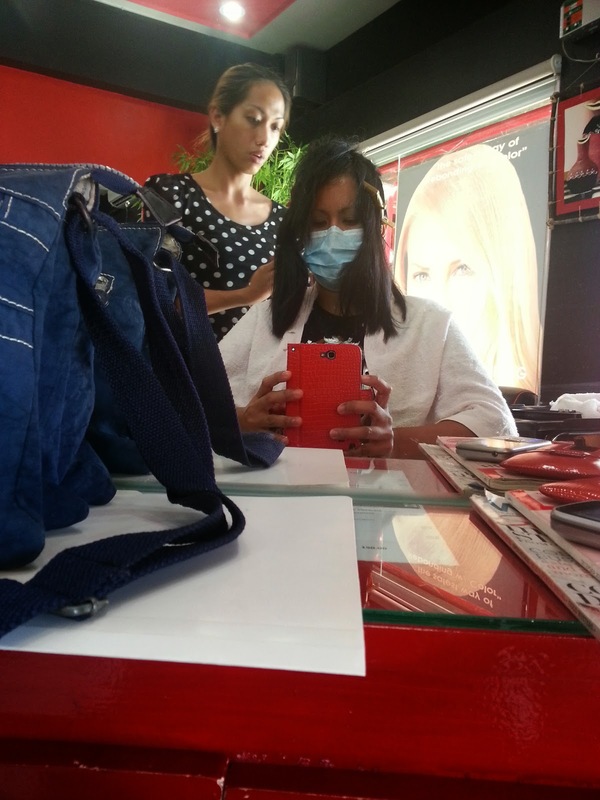 My greatest fear is having an allergic reaction to the components of the hair straightening and treatment formula. Thankfully though, the ones used at reputable salons like HAIR CUT ENCARNACION FRANCISCO SALONS are of the best quality and very rarely do cause any irritation. 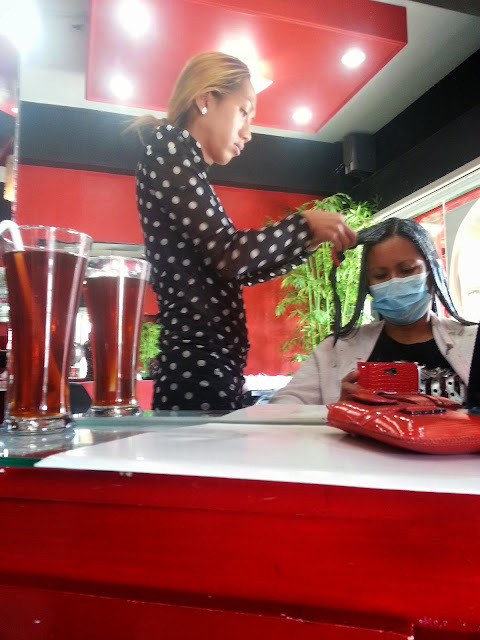 I am writing this post for women who have not yet tried having a HAIR REBOND and are curious about the whole process, what to expect and HOW TO TAKE CARE OF THEIR REBONDED HAIR. 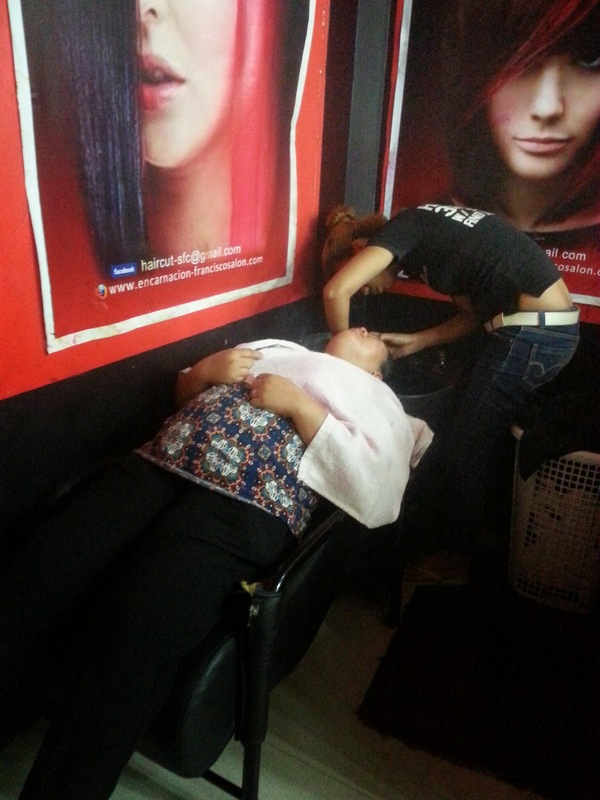 As much as possible have an appointment set with the salon of your choice. 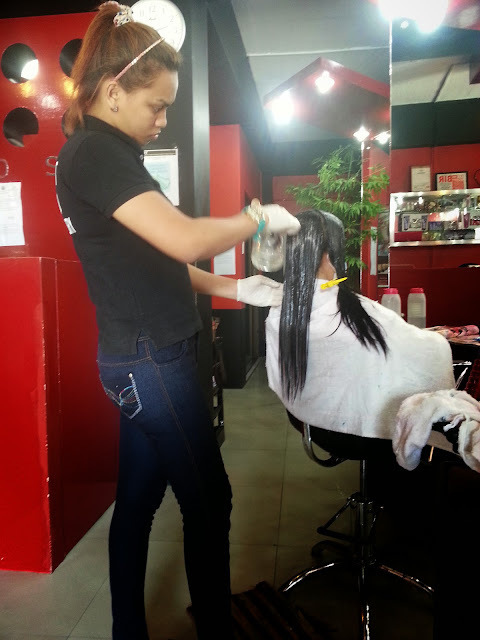 ~Especially during peak season, holidays, graduation time etc when the salon could be fully booked and you'd waste a lot of time just waiting for your turn. In our case we were lucky we went just at the perfect timing, no other customers yet and surprisingly one of my friends knew the senior stylist. 1. You'd have to choose your hairstyle. ~So as not to regret after, you could decide on that weeks before you undergo the process. On my part I wanted a totally new look and let go of my long wiry hair. One thing I regret is forgetting to save my cut hair to donate to cancer foundations. 2. A straightening formula will be applied on your hair. ~You'd have to choose the kind of hair pampering you like, a first-timer would pay less because a less powerful formula will be needed to straighten the hair whereas for us who have previously undergone rebonding, apparently a stronger formula will be required and hair treatment is highly needed so we underwent milk rebonding (a milk based hair treatment was applied on our locks). More sophisticated treatments are also available but we chose the not too expensive one. ~The formula has a somewhat offensive smell so I suggest you bring a mask if only to keep you more comfortable. It is fairly tolerable though but for those of you like me who hate chemical-like scent you'd better go armed :) It will take around twenty to thirty minutes to allow the cream to work on your hair strands so bring boredom busters like your favorite book, or mobile applications. The parlor had strong wifi connection. I was not in the mood for social networking though and I did not want to waste my smartphone battery so I played the archival game SNAKE on my not too techie mobile phone. 3. Your hair will be washed like a baby lying on bed. ~I loved this part- nothing like the feel of refreshing water hugging my head and having someone wrap towel on it. I suggest you do not eat and drink much just before undergoing the procedure otherwise that position will make you uncomfortable. 4. Your hair will be blow dried. ~Because I have a somewhat thick hair texture the drying stage took several minutes hahaha. I realized that there are gentle stylist who have the patience to handle your head with care unlike others who would pull each hair strand like their life depended on it. I truly appreciate Iyah's gentleness. 5. After drying, just like a cloth, your hair will be ironed. ~This stage is crucial because very thin layers of strands have to be carefully ironed flat and you have to keep still otherwise you'll get your scalp burned LOL. If you are intolerant to heat, it could also be an issue. It isn't too uncomfortable though, just enough to make you say "beauty is pain"..as what Iyah told me while washing my hair to prepare me for the next process. It is worth noting though that there isn't any pain at all in the whole process, just the PATIENCE to endure the minutes of crucial beautification process which I personally think is worthwhile. 6. Another cream will be applied on your hair, with cellophane treatment with a hair color of your choice. ~I chose a hazelnut kinda hue which will only be visible when light rays fall on my hair. My friends and I are thinking of having real hair dye for a change on our next salon visit. 3. Use Clarifying Shampoo for at least once a month. 6. Have A Balanced Diet. 7. Avoid Changing Your Hairstyle. It wasn't just the pampering that I enjoyed but the GREAT TIME we had chatting and throwing away all our stress, for several hours at least. Thanks to the awesome CUT ENCARNACION FRANCISCO SALONS, Sevilla SFC Branch for the great service! ...until our next REBOND adventure!! This is the first time I've heard of something like this. How amazing! 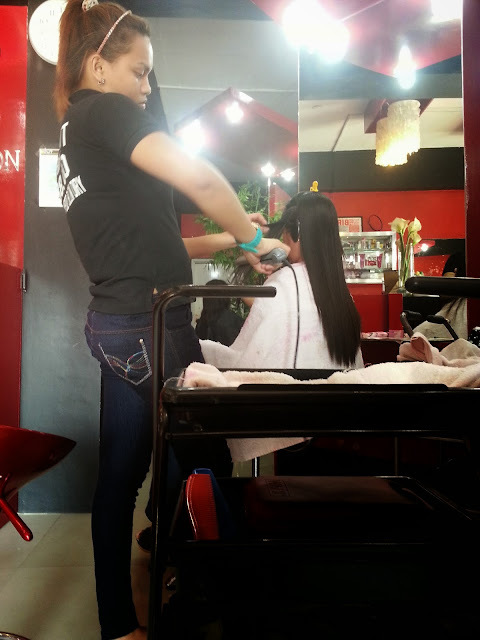 ask ko lang po sana if nagpagupit ka ng bob cut better po ba na iparebond na lng kesa everyday ka mag hairdryer?